"A delicious dinner roll that is made from beer, honey, and a slight pinch of cinnamon. Excellent with turkey, roasts etc. Different beer may be substituted, but be advised that a highly hopped beer will create an astringent bitter taste. The unique taste comes from the malt used in making the beer." Allow 10 to 12 ounces of beer to reach room temperature and go flat. This will take approximately 3 to 4 hours. Combine flattened beer, butter, cinnamon, salt, and honey in the pan of bread machine. Add flour and yeast being careful that the yeast does not touch the liquid. Select Dough setting, and Start. After the dough has risen, remove the dough from the pan. Form into a long loaf; cut and form rolls. Place on a floured baking sheet, cover, and allow to rise for approximately 45 minutes. Brush top of rolls with melted butter. Bake at 350 degrees F (175 degrees C) for 30 minutes, or until golden brown. Lighter than an average roll and beautifully golden! 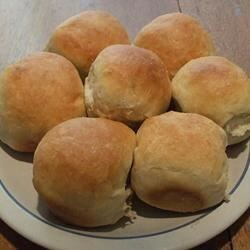 I made these rolls for my family of four...2 being the pickiest eaters in the world...and they were gone before dinner was finished! Great recipe that I will definitely be using quite often! Added Poppy and Sesame seeds on top. Outside came out a little hard, but nice and soft on the inside. Not bad, but not outstanding either. I have made this recipe into rolls and also baked it as a loaf in the bread machine. Either way it turns out great and my husband loves it! This recipe was just what I have been looking for. Turned out great. I just didn't put in the cinnamon. I will make these agian. I used the full 12 oz. of beer and used half all-purpose flour and half whole wheat flour. Thanks for sharing! good rolls, made in the bread machine in no time at all. I was in a hurry and skipped the flattening of the beer sparkle: they were ok just as well. They freeze well, too.